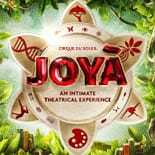 Starting November 8th JOYÀ will be housed in a 600-seat theater custom-built for Cirque du Soleil, which draws inspiration from the natural beauty of the surrounding Riviera Maya jungle. A premium dinner service will feature international gastronomy and the finest beverages – including champagne from Mercier, one of the world’s most renowned champagne producers, located in the Épernay region of northern France – incorporated into a theatrical prelude to JOYÀ. JOYÀ combines culinary and performing arts in an intimate theater setting to engage the audience’s five senses. Drawing on Mexico’s history and heritage, JOYÀ tells the story of a naturalist and his granddaughter embarking on a transformative quest to uncover the secrets of life. Through their wonderfully disorienting journey they will discover a hidden gem in the mangrove, passing along the poetry of love and life to future generations. The name JOYÀ is rooted in the Spanish “joya” meaning jewel or pearl, and alludes to a person or event of great value. Through the performance, the granddaughter will discover joy and wisdom by sharing an extraordinary experience in an unlikely place.